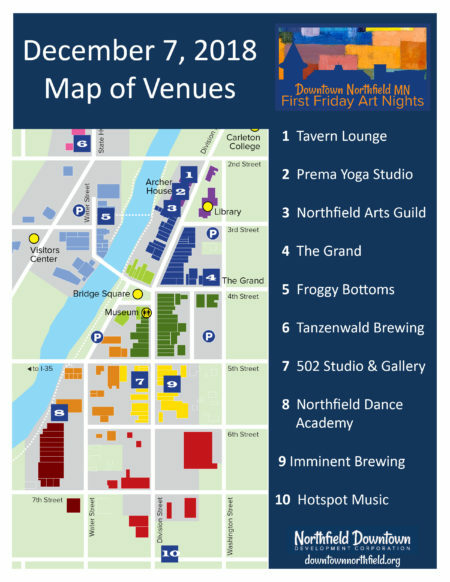 Stroll through Downtown Northfield on December 7th and enjoy art experiences of all kinds! 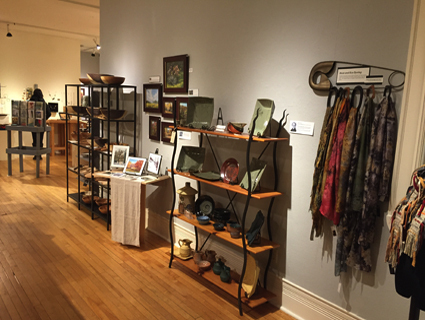 5:00-7:00 pm Book Signing at the Northfield Arts Guild lobby, 304 Division Street. Authors Denny & Karen Vinar will be signing copies of their book How Did You Find Me…After All These Years? 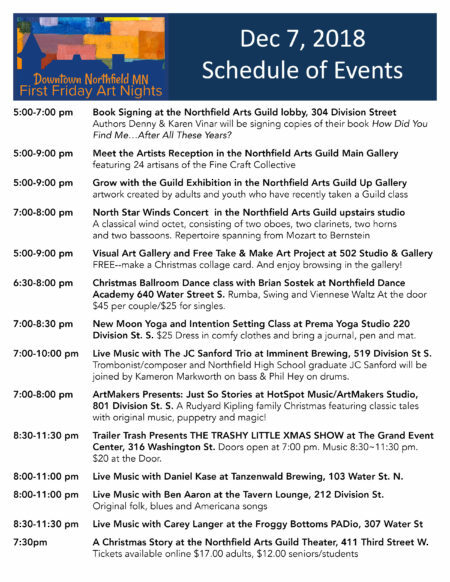 7:00-8:00 pm North Star Winds Concert in the Northfield Arts Guild upstairs studio. One of the Twin Cities’ newest chamber ensembles, North Star is a classical wind octet, consisting of two oboes, two clarinets, two horns, and two bassoons. The group performs repertoire spanning from Mozart to Bernstein while enthusiastically embracing contemporary composers. 7:00-8:30 pm New Moon Yoga and Intention Setting Class at Prema Yoga Studio 220 Division St. S. $25 Dress in comfy clothes and bring a journal, pen and mat. 7:00-10:00 pm: Live Music with The JC Sanford Trio at Imminent Brewing – 519 Division St S. Trombonist/composer and Northfield High School graduate JC Sanford returned to his hometown in 2016 after spending over twenty years in Boston and New York City. JC will be joined by Kameron Markworth on bass & Phil Hey on drums. 7:00-8:00 pm ArtMakers Presents: Just So Stories at HotSpot Music/ArtMakers Studio 801 Division St. S. A Rudyard Kipling family Christmas featuring classic tales with original music, puppetry and magic! 8:30-11:30 pm Trailer Trash Presents THE TRASHY LITTLE XMAS SHOW at The Grand Event Center – 316 Washington St. Doors open at 7:00 pm. Music 8:30~11:30 pm. $15 Advance Tickets / $20 at the Door. 8:00-11:00 pm Live Music with Daniel Kase at Tanzenwald Brewing – 103 Water St. N.